The young Queen’s dressmaker was celebrated above all for her creation of poufs; but as the novelty of the pouf aux sentiments had passed, it was imperative that a new style should be invented. Rose Bertin’s genius rose to the occasion, and hats a l’Iphigenie and poufs a la circonstance (topical toques) made their appearance. The first style was well adapted to current events. The Court was in mourning for the King, and, according to the “Correspondance Secrete,” hats a l’Iphigenie were made of a simple crown of black flowers, surmounted by a crescent of Diana, with a short veil falling at the back, partially covering the head. triumph of Gluck’s opera was flattering to her claims as a musical critic. 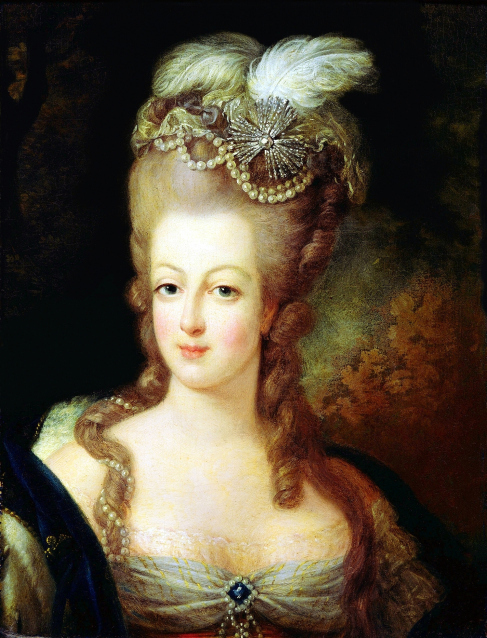 The pouf a la circonstance was a flattering tribute to the new monarch. It was intended to represent the change of reign. Mlle. Bertin possessed all the qualities that make for success; she brought to the profit of her trade the obsequiousness of the most assiduous courtier. The pouf was composed of a tall cypress ornamented with black marigolds, the roots being represented by a piece of crape; on the right side a large sheaf of wheat was placed, leaning against a cornucopia from which peeped out an abundance of grapes, melons, figs, and other fruit, beautifully imitated; white feathers were mixed with the fruit. The hat was a riddle; the answer was as follows: While weeping the dead monarch, though the roots of sorrow reach to the hearts of his subjects, yet the riches of the new reign are already looming in view. These poufs varied in style: some represented the sun rising over a wheat-field, where Hope was reaper, being the same riddle more briefly depicted. The pouf a la circonstance was short-lived, being quickly replaced by the pouf a l’inoculation another of Mlle. Bertin’s inventions. The King had been vaccinated on June 18, 1774. The custom of inoculation in use for centuries among the peoples in the vicinity of the Caspian Sea had been imported into England from Constantinople in 1738, and into France in 1755. The operation on the King gave Mlle. Bertin a new idea; the pouf a l’inoculation celebrated the occasion. It represented a rising sun, and an olive-tree laden with fruit, round which a serpent was twisted, holding a flower-wreathed club. The classical serpent of Esculapius represented medicine, and the club was the force which could overcome disease. The rising sun was the young King himself, great-grandson of the Roi-Soleil, to whom all eyes were turned. The olive-tree was the symbol of peace, and also of the tender affection with which all were penetrated at the news of the happy success of the operation which the King and the Royal Family had undergone.